The tombstones in these two photos are both taken in the Union Cemetery at St. Clairsville, Ohio. In both cases, the tombstones display elaborately carved figures leaning on an inverted torch. In the example above, a chubby baby boy sits atop a pile of rocks with a scroll at his feet. The baby leans against the torch with the flames swirling from the bottom. 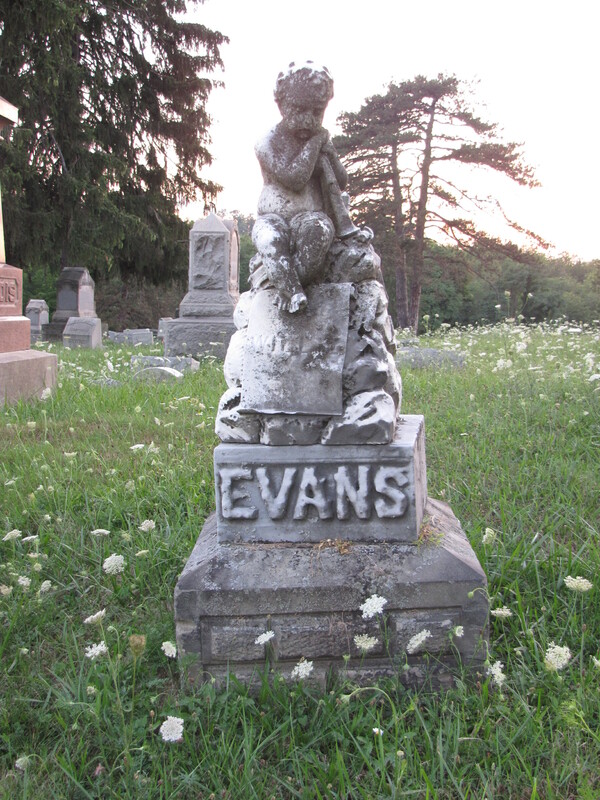 The soft white marble gravestone is eroded and covered with lichens and the inscription is difficult to read, except for his name, “WILL” which is displayed on the scroll and “EVANS” which appears on the base. 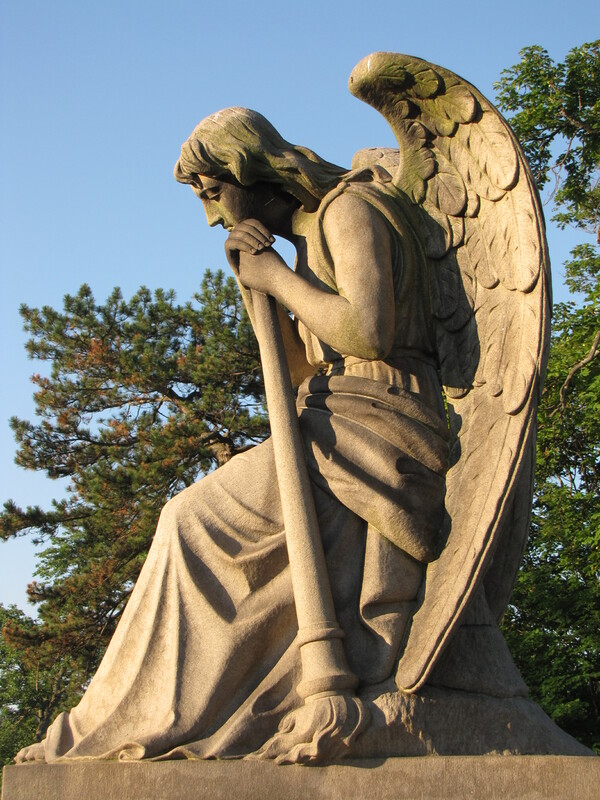 The angel in the photograph below looks downward with an almost wistful expression as she leans against the torch, the flames curling at its base. The beautifully carved sculpture marks the graves of Richard and Mary Riley, both of whom died in the 1880s. In both cases, the flame is symbolic of the soul. The inverted torch represents a life that has been extinguished. the Angel on the Riley tomb is not a female Angel. The inverted torch does not mean life was snuffed out as it is still lit. First, the sources I have checked indicate that the inverted flame does in fact symbolize death but the flame still being lit suggests the soul continues to exist in the Heavenly Realm. Secondly, the angel may be male or it may be female. Many carvers styled their angels to be androgynous purposefully so it is difficult to tell that for sure. Thorantos laments the teenage wasteland that begot death to non believers, per his order. I can find no references to Thorantos.